You all know who they are. These kings, nay, legends of lacrosse social media put the parts of the MCLA, the SELC and Georgia lacrosse on the map. 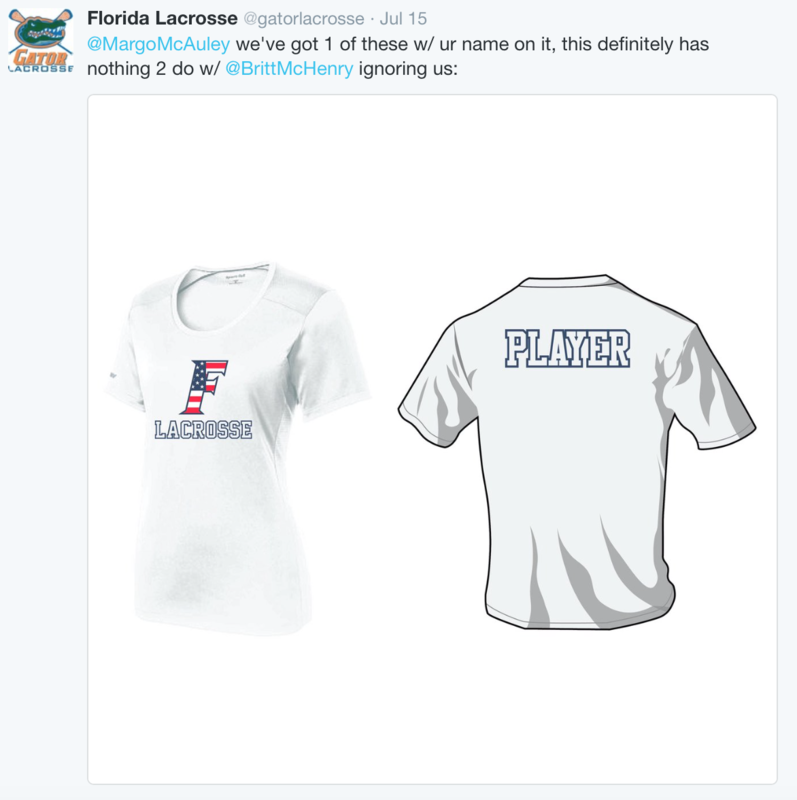 They were the first ones to get club lacrosse Twitter right and are now the template for other aspiring teams. I had the honor of interviewing the men behind this iconic twitter account. We are fortunate enough to get two sets of answers to my interview questions. Jake Sciotto (@callmeshitto) was the former “first string tweeter” for the Dawgs. He and his young Padawan Grant DeSelm (@grantdeselm) were gracious enough to both provide answers. Grant has recently taken the reigns of the account and has been mentored by Jake. Without further ado I present, The Dawgz. J: Somebody over there in the Midwest said dang, these guys are good at sports. We should make them D1 and give them money. I think that’s how it works at least. I don’t really know. Grant and I can barely keep up with who is responding to a particular mention sometimes, so we often can’t keep track of current events. G: I mean first Denver now Utah, lacrosse out in the Middle East is really on the come up. D: If the opportunity presented itself would you play Utah on your schedule? J: I believe we would happily offer ourselves to get slaughtered by the Utes if the Creator blessed us with such an opportunity. G: The Utes would love Athens because we have a gondola from our fields to downtown. Utah’s keeper has to let at least five goals in to get a lift ticket though. D: Is the University of Georgia planning to make you guys D1 after seeing Utah? J: What he means to say is that if the University would consider making the jump to varsity, the girl’s team would likely be considered first. It’s much deserved considering that they won the WCLA National Championship this year (shouts 2 our ladies) and are all very, very good at sports. D: What did you guys think of the 2016 MLL All-Star Game? J: I thought it was cool. It’s easy to watch the MLL and forget that these guys ripping 102 from outside the two point line are doing this for a hobby. It’s no secret that they don’t get a lot of paper in the league, which makes their presence even more important. They do it for the love of the game. That’s tight. D: If the MLL expands what should the new team name be? J: Literally any city, as long as the team name is the Velociraptors. D: Have the Atlanta Blaze hit you guys up for a few players with Kevin Rice and Matt Mackrides out due to injuries? J: It’s unfortunate that K-Dawg (Kevin, if you’re reading this, this is your new nickname now) and Mackrides are out for the season, but we have not received any calls. G: I’ve even stood outside the office and knocked on the door to ask. Did you know their office has armed security? 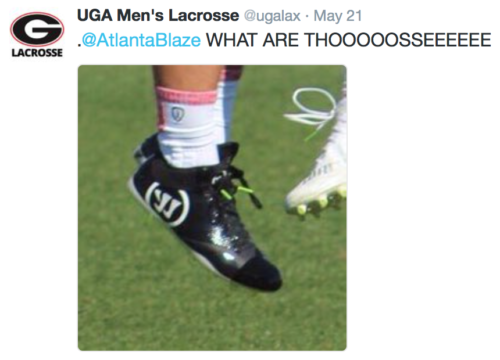 D: Who will be the SELC (UGA’s Lax Conference) 2017 Champions? J: The team that scores the most points. D: Will Britt McHenry go with a Florida lacrosse shirt or a UGA lacrosse shirt and why? G: Miss McHenry committed to the G the moment she laid eyes on our twitter page. Case closed. J: Do you think she believes in love at first sight? D: Do you guys have any live tweet takeovers on the docket? J: Real talk – our Georgia Swarm takeover was a lot of fun. Getting to sit up in the catwalk and tweet a game live from the Swarm account was unreal. My first grade teacher told my mom that I’d be president one day, and this is what I think she was talking about. As for other takeovers on the docket – we slide in mentions here and there to remind everyone that we’re available. Anytime, anywhere. Tweets on deck. All day. D: Any advice to recruits trying to get noticed? G: Don’t mess up. That’s huge IMO. J: I suppose that my generation of youngbloodz had it easy coming out of the south because there were less of us trying to get noticed by the same number of coaches. Nowadays, it involves money-grabbing summer club programs and parent politics that can ruin it for a lot of kids. When it comes down to it, your grades and your game will speak for themselves. D: For the young recruits thinking about picking a school to play for why should they pick UGA? G: Great academics. Great family atmosphere. Great SPORTS. Also we have fun. J: Just come visit. You’ll get it. D: What happens to one of your teammates if he wears white socks and black cleats? G: We’re all in college and mom probably isn’t here to do your laundry 24/7 so if your icey whites are dirty for practice, we let it slide. If you show up for games looking like a stormtrooper, I promise you won’t see the field. J: Everyone gets one chance. Past that, we take you out into the parking lot and beat you with a sack of hammers. Just kidding! We use a phonebook. D: If you could pick anyone to be your coach who would it be? G: Hulk Hogan as athletic trainer BROTHER. J: Hulk Hogan. Steven Seagal maybe. D: Will we see you guys live tweet the 2017 NCAA Title with Booker Corrigan announcing? J: My man Booker Corrigan is criminally under-appreciated. Booker takes a very vanilla environment and turns it on its head. Many people watching lacrosse for the first time could literally be bored to death by some of the commentary – Booker is the defibrillator. He’s in the DMs all the time though, y’all already know we stay cookin’. And there you have it! 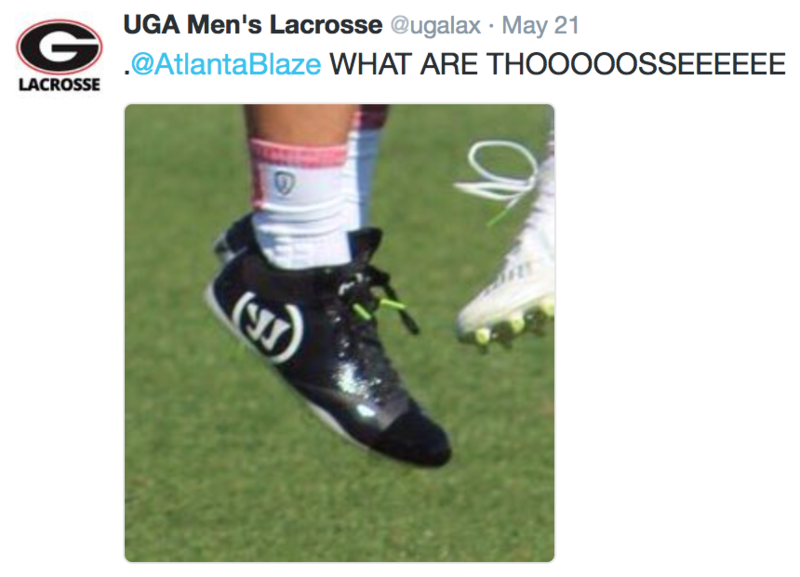 MLL, Utah Lacrosse, Brit McHenry, Hulk Hogan and Steven Seagal: @ugalax awaits your response. If the next MLL team is not named the Velociraptors you will find me in Athens rioting with a bunch of club laxers. A huge thank you to the UGA Lacrosse team, especially Jake and Grant. We truly appreciate your time and thank you for the interview. I went into this interview with zero expectations and was still impressed. If you do not already follow them on Twitter I highly suggest you do. Your day will be made every time you read one of their masterpieces.